"With a huge debt to Robinson Crusoe and the film Cast Away, this ambitious story stars troubled teenager Frances, whose nurturing love for her younger brother drives her to imagine escaping their abusive, dysfunctional home." —The Daily Mail As part of an “Outward Bound” style treatment for young people who’ve committed crimes, Frances finds herself on a plane to a remote village where she will do community service in exchange for staying out of juvenile detention. 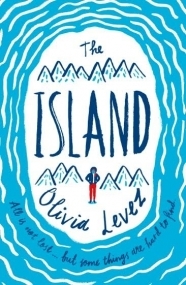 But an accident leaves her alone on a small island in the middle of the Indian Ocean. She has to find water and food. She has to survive. And when she is there she also has to think about the past. The things that she did before. The things that made her a monster. Nothing is easy. Survival is hard and so is being honest with herself. So when she discovers another survivor on the island, will it bring out the worst in her again? Or will it finally help her to see that her future is worth fighting for? A gripping and thoughtful story about a girl determined to survive against all odds and find the courage to become the person she wants to be. The Island is just a book you can’t put down. The book consists of short chapters that flip between the past and the present. While reading, it gave me very Lost TV feel. What I liked best: The reader has to piece together the events in Fran’s life that forced her to get on that ill-fated plane. Fran isn’t the easiest person to get to know- and that is the point. You don’t want to root for her at first. What makes this story great is that you constantly have the desire to turn the page. I needed to know- How will Fran get out of this one? Or What horrible thing did Fran do? Olivia Levez weaves in facts and tidbits about survival skills and the brutality of Mother Nature. The writing style is very easy to read and she hooks you into the story quickly. While hopefully, we never find ourselves stranded on an island after a plan crash, Fran’s story is one that is relatable. She has a depth; she isn’t perfect. Due to the harshness of life she has built a wall and become “a rock.” But once she reveals all the intricate pieces of herself- she is a character worth loving. This is one book that should be on everyone’s radar. Fast-paced and incredibly written, readers will be captivated by Fran and her desire to just survive.